Seismic Safety Products Earthquake gas shutoff valves. Northridge seismic shutoff valves prevent gas fires caused by earthquakes. Prevent gas fires caused by earthquakes. The Northridge valve shuts off your gas during an earthquake. 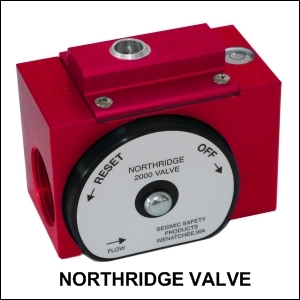 Protect your home and family by installing a Northridge valve by Seismic Safety Products. Our valve automatically shuts off your gas during an earthquake giving you peace of mind.